The longest I've ever stayed at one job was six years at Computerworld, during which time I saw the publication's transition from a magazine with a Web site to a Web site with a magazine. Through it all, we had copyeditors to ensure the continued quality of all our content, checking articles for clarity and consistency issues that may've escaped the news editors who worked directly with reporters on assignments and story structure. As with most publications, Computerworld maintained a style guide — a shared document that all copyeditors referenced to verify whether the magazine presented quotations are in the past tense or present, if it was "Web site" or "website", and other common questions. My own first need to consult this guide came in March 2008 when contributing to the anthology, "Tales from the crypt: Our first computers". 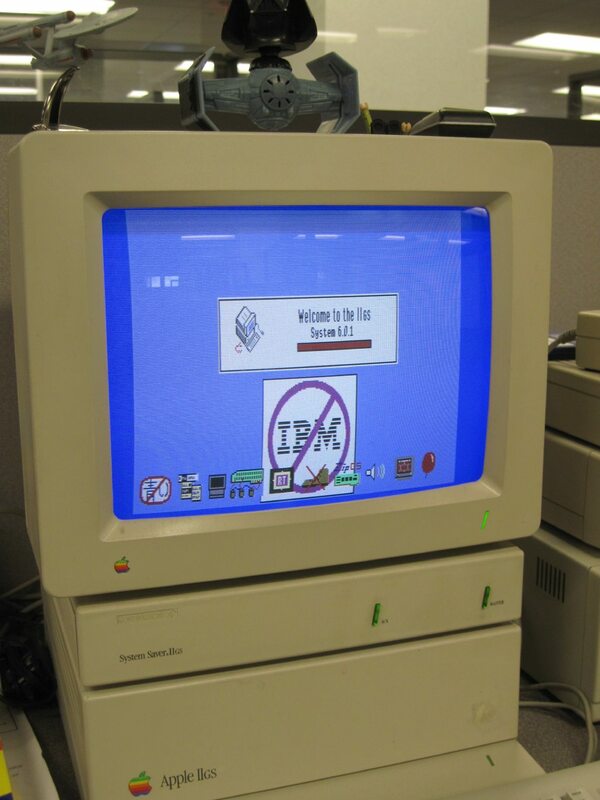 I was unsure if I should write my model of Apple as IIGS, IIgs, or something else. As Computerworld's resident Apple II fanboy expert, I long wondered if this style guide entry was not written with me in mind as a sort of gentle ribbing. Although most of my co-workers had been in the industry long enough to remember and appreciate the elegance of the Apple II — heck, one of my colleagues was none other than the former editor-in-chief of inCider/A+, Dan Muse — it is nonetheless difficult to explain why one would carry that torch into the 21st century. Easier to poke fun at it, right? It was only when researching this blog post that I confirmed this particular entry in the style guide well predates my tenure at Computerworld. It figures that a publication that had been around since 1967 would've addressed this issue long before my arrival. I should've checked my ego at the door! Computerworld was a great source for Apple II news during my time there, and they continue to entertain the topic with coverage such as video profiles of KansasFest 2013 attendees. Given this support, readers should be glad to know the Apple II has earned a place at Computerworld, both behind the scenes and on the front page. After six years as an editor at Computerworld magazine, I've given my notice. It's time to try something new. Although I'm looking forward to new opportunities, I'm also reflective of all I've accomplished here since my first day on February 5, 2007. I was not hired as a features writer yet nonetheless managed to produce more than three dozen stories. Many of my articles were influenced by my experiences in the Apple II community, such as "CompuServe, Prodigy et al. : What Web 2.0 can learn from Online 1.0" (I was the APPUSER Forum's Member of the Month [MOTM] — October 1992, I think) and "Ben Heckendorn takes a mad-scientist approach to game console design" (which also became Juiced.GS's December 2008 cover story). Even more articles were directly about the Apple II itself, including "Sold on eBay: New-in-box Apple II, never opened" (Juiced.GS's March 2008's cover story), interviews with Apple II users who are experts in their field, and coverage of KansasFest every year from 2007 through 2012. Computerworld also put me in touch with several folks who became KansasFest keynote speakers: when I liveblogged from KansasFest 2007, Lane Roathe left a comment to the effect of, "That event is still going on??" Using my administrative rights, I pulled the contact info from his comment and got in touch. A year later, he was our keynote speaker — an attendance he repeated in 2012, putting him back in touch with his id Software co-founder, John Romero. The effect of these connections is long-lasting, and for as long as Computerworld maintains a persistent online archive, those stories will remain — and possibly grow, as the invitation to freelance has been extended. So though I'm not concerned about the state of this body of work, I am nonetheless saddened as I clean out my cubicle to realize the Apple II's presence is not long for this office. 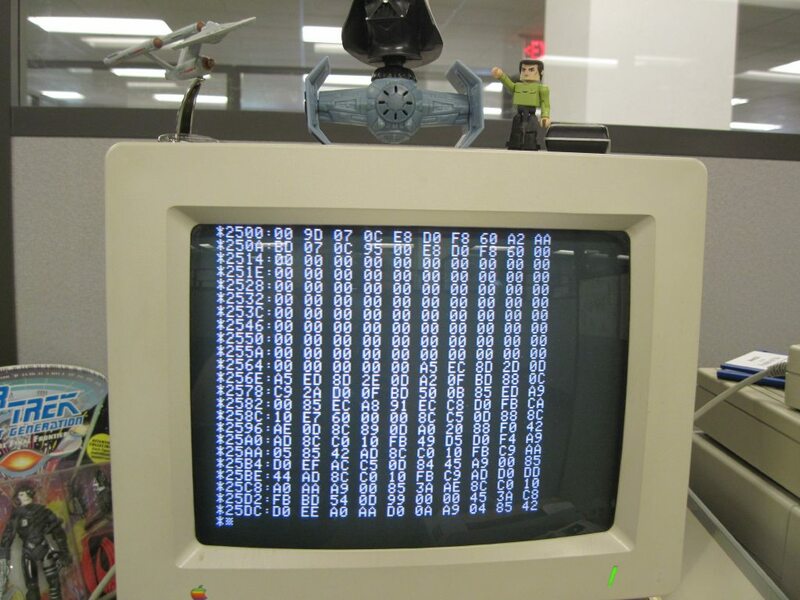 My Apple II hasn't seen a ton of use in its days at Computerworld, but the tasks it performed were essential. With ADTPro, it saved my brother's college papers, my friend's childhood memories, and the source code of PublishIt! It was the occasional lunchtime diversion as I would boot up Lode Runner, Oregon Trail, or Microzine. 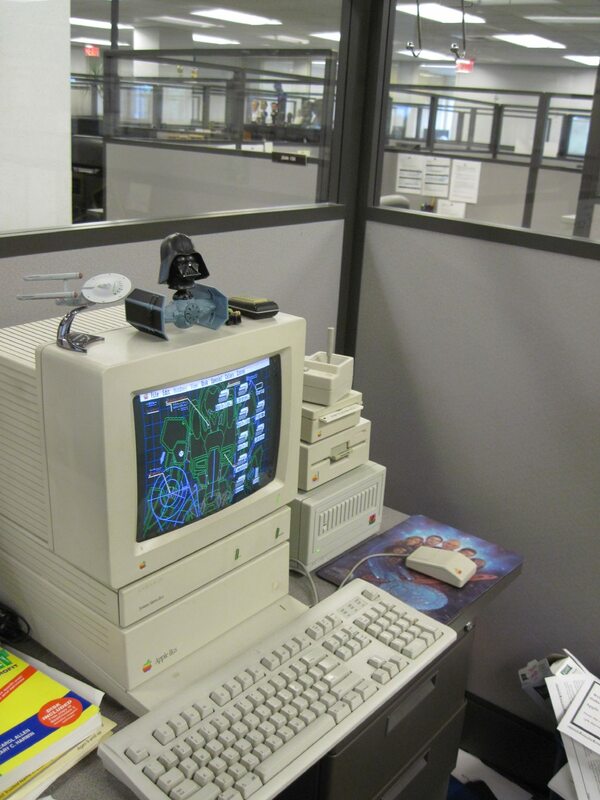 And it was a talking point for any new employee, whose eyes would widen slightly at the sight of such an ancient computer — yet not as ancient still as its host, with Computerworld having been founded in 1967. Given my employer's history, it's no surprise that I'm not the only Apple II alumnus in the building: Computerworld all-star reporter Gregg Keizer is formerly of Softdisk, and CIO.com executive editor Dan Muse was editor-in-chief of inCider/A+, which employed many folk who are still with IDG, Computerworld's publisher. But I've not seen any of these esteemed colleagues, all authorities in modern enterprise IT, cling to their old tech and bridge it into their modern careers. After my Apple II, the next oldest computer I've seen here is a 2006-era Mac mini. So my departure from Computerworld invokes not only the usual regret when bidding adieu to such wonderful co-workers, many of whom have become friends for life. It also means the end of the Apple II's official relationship with a storied institution. I've been invited to freelance for this and other IDG publications, but though some of my Apple II stories were occasionally the top-read stories in their months of publication, in general, I doubt the free pitches of computer nostalgia that the editors were happy to entertain from a passionate in-house writer will warrant tapping their limited freelance budget. So yeah: I'm wistful. Nostalgic. Melancholy. The Apple II will come with me to my new workplace. But that will be a smaller team, in a less social environment, with stricter network regulations and fewer media opportunities. It won't be the same. Nothing ever is. But it's time to move on. I've been cleaning out my cubicle for the past week. 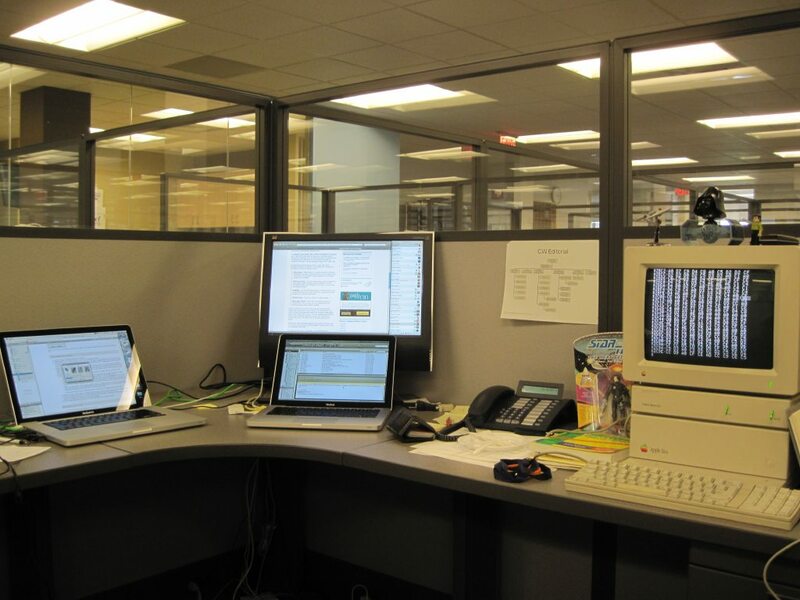 I thought it would be an appropriate bookend to this blog post to share a photo of my cubicle, sans Apple II. But that's not how I want to remember this small space that, for a few years, was a corporate gateway to the retrocomputing community. The Apple II will be the last thing I pack up. That's when the heart has gone out from the building. The Apple II is a part of me. When it goes, I go.